One of 12 made - now worth a fortune. WE’LL START with the kicker line. $9.61 million dollars. That’s how much this 1963 Jaguar E-Type Lightweight sold for at Bonham’s Scottsdale auction on January 19. Those of you with longer memories might well recall Chassis S850667 claiming the Australian GT Championship in December 1963 on its very first run-out in anger. That was at Calder, Victoria and in seven races during the next season, Jane was on the podium at least six times. The car then went to Europe, came back to Australia and in 1965 set a class record of 150mph at Bathurst. It was then used as a promo vehicle for Bob Jane’s T-Marts before being sold in 1980 to Peter Briggs, owner of the York Motor Museum in Western Australia. There it remained until 1999, when it went to the US, selling at the time for $80,000 to somebody with a real eye for a bargain. Just 12 examples of this model were constructed in-period, making the the E-Type Lightweight rarer than Jaguar’s C-type (53 built) or Ferrari’s 250 GTO (39 built, including three 330 GTOs). Therefore, they don’t cross auction blocks all that often, and a storied example such as this with less than 4000 miles on the clock was always going to generate serious interest. 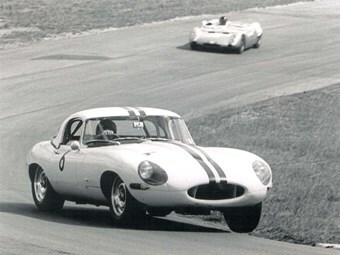 Perhaps there’s an argument to say that the E-Type Lightweight is still undervalued. Whichever side of that fence you stand on, it’s nevertheless jaw-dropping to see such a piece of Aussie racing heritage smash global auction records in this manner.